VAIO has updated its popular 13-inch VAIO S laptops sold in the U.S. with Intel’s latest 8th Generation Core i5/i7 processors featuring four cores. Besides new CPUs, the systems have also added the company’s new TruePerformance technology, which is designed to maintain a higher turbo boost frequency for longer periods of time. 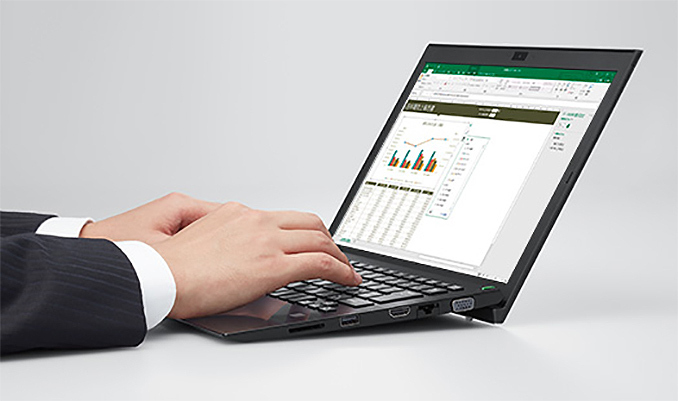 The new VAIO S also feature a fingerprint reader and a TPM 2.0 module, emphasizing their business nature. Meanwhile the 2018 VAIO S retain their “classic” chassis along with a set of connectors, so they do not support modern headers, such as USB Type-C. The new VAIO S laptops are based on Intel’s quad-core Core i5-8250U or Core i7-8550U processors with Intel UHD Graphics 620 accompanied by 8 – 16 GB of LPDDR3-1866 memory and a PCIe SSD featuring 256 GB, 512 GB or 1 TB capacity. One of the key features of the 2018 VAIO S notebooks is the TruePerformance technology that promises to maximize time that a CPU works at increased frequencies, giving VAIO a competitive advantage over other laptops based on the same processor. VAIO’s TruePerformance tech is a combination of VAIO’s increased CPU power limits and a cooling system that can handle the increased heat. For reference, Intel’s Turbo Boost 2.0 technology increases the CPU frequency in increments of 100 MHz when an operating system requests a higher performance state. Typically, the amount of time that a CPU can work at its maximum Turbo Boost 2.0-defined frequency is about 20 to 30 seconds (according to VAIO), then it has to reduce its clocks because of thermals and other factors. 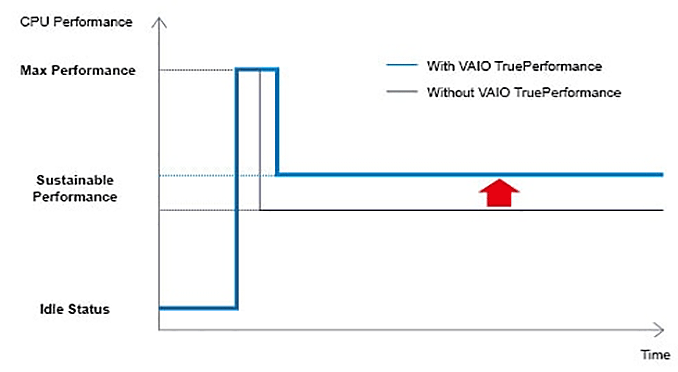 VAIO claims that even if it increased the amount of time a processor operates at its TB 2.0-defined peak to 40 seconds, this would not bring many benefits to end users. Instead, engineers from VAIO increased the base TDP limits of Intel CPUs to prolong the amount of time the chips operate at an above-nominal frequency (or frequencies), but below the TB 2.0-defined peak frequency. The company does not say whether it boosted TDP of Intel’s 8th Generation Core i5/i7 CPUs all the way to 25 W from 15 W (an increase allowed by Intel and called configurable TDP-up) which would explain and define higher frequencies. 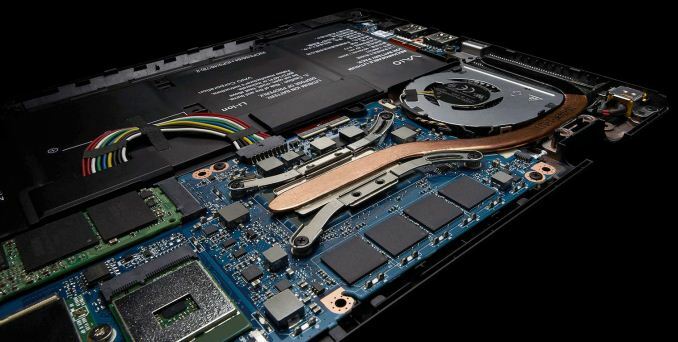 Meawhile, VAIO admits it needed to redesign its CPU VRMs as well as its cooling system to remove the extra heat. The new cooler has a thicker vent (and probably an enlarged radiator) as well as apply a new fan rotation speed control algorithm to ensure that the chips do not overheat. Based on graphs demonstrated by VAIO, its TruePerformance technology can increase a CPU performance in Cinebench by 11% ~ 13% when compared to the same CPU without the tech. Meanwhile, the increased TDP limit can also lift iGPU performance by 4.5% ~ 8.6%. While performance increases are not radical, they add value to VAIO’s new PCs. Now, back to the laptops themselves. This year’s VAIO S systems are outfitted with a 802.11ac Wi-Fi + Bluetooth 4.1 module, a GbE connector, a 0.92 MP webcam, an SD card reader, a fingerprint reader, a TPM 2.0 module and so on. Configuration of I/O ports remains unchanged from the original (non-Sony) VAIO S model launched in 2016: three USB 3.0 ports (including one always-on USB 3.0 for charging), a TRRS audio connector, an HDMI and a D-Sub output. When it comes to battery life, the new model S can work for approximately 8 hours 45 minutes on one charge, depending on the model and usage, which is in line with previous-gen VAIO S systems, but is hardly impressive when compared to other modern laptops. As for display and physical dimensions, the new VAIO S features a 13.3” screen with a 1920×1080 resolution, it weighs just about a kilogram (2.34 lbs) and is only 15 – 17.8 mm thick. 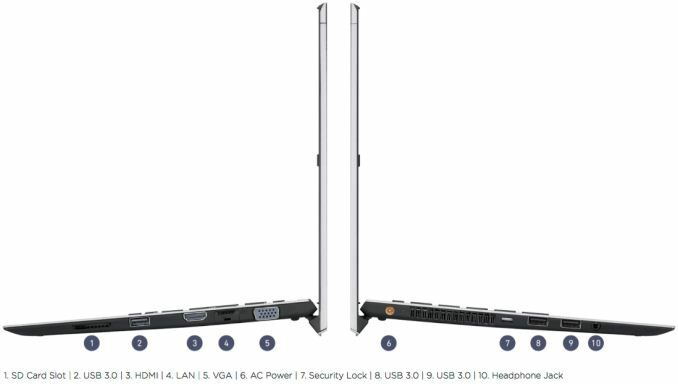 When compared to the 2016 VAIO S, the chassis got ~1.8 mm thicker at its thinnest point and ~0.2 mm thinner at its thickest point, which is hardly a big deal for portability. The new VAIO S will be available in the U.S. this month at MSRPs starting from $1,199. It is noteworthy that in Japan VAIO offers two business-oriented VAIO S lineups — with 11.6” and 13.3” displays (there is also a family with a 15.5” screen, but it is barely aimed at business customers). Both VAIO S11 and S13 are based on Intel’s latest quad-core Core i5/i7 8000-series processors, come with optional LTE modems and even feature spill-resistant keyboards that are never mentioned in case of the U.S. VAIO S 2018. I like how they're trying to spin the fact that they're just now getting around to engineering proper cooling for their notebooks (or at least they're claiming they do). When vaio was a part of sony, yes they were awful. Vaio is a stand alone company and has been for a few years. And they are definitely better all around since that change. Their cooling is top notch, they are the only manufacturer to fit a full 45w cpu in a tablet (Vaio Z Canvas), and I've never had any issue with overheating. Hottest I've seen it get converting raw images in lightroom is 88c. Compare that with the surface book I had (1st gen) that would hit 96c (with just a dual core cpu). I hope so. I lost faith in Sony VAIO's after their adventures with Crusoe CPU's and their poor cooling designs of Pentium 4 notebooks...but I guess everyone's P4 notebooks were pressure cookers. I just saw one of the S11 in person this weekend. It's kinda rare sight, as it's not available in my country. It looks really good.